Posted on Wed, Jan 2, 2013 : 5:22 a.m. This exhibit illustrates the positive energy and meditative power such art can command. And boasts work by many of the most accomplished landscape painters in and around Washtenaw County. As Lisa Powell, CCA visual arts programming coordinator, recently said, the display is a coordinated effort between the CCA and Chelsea Community Hospital. “The idea that art inspired by nature has the ability to positively affect a person's attitude and even well-being has long been suggested both anecdotally and through studies,” said Powell in an interview. “It’s been increasingly used by hospitals, physicians, therapists and individuals. There’s certainly a lot of “renewal” on hand at the CCA as each of the 25 artworks in the exhibit has been reproduced for one-time use only in two sets of prints that have been placed in 50 inpatient rooms at the Chelsea Community hospital. Chelsea artists selected by the hospital’s Art Committee include Janet Alford, Rose Bradley, Missy Cowan, Susan Craig, Neta Mills, and Robin Phillips. Ann Arbor is represented by Marty Walker; Grass Lake by Joan Kelley; Howell by Jan Herrick; Milan by Nancy Murray; Whitmore Lake by Janet Kohler; and Ypsilanti by Elaine Ang and Carolyn Weins. One observation is in order: When the CCA and Chelsea Community Hospital say these artworks were selected for their views of nature, they literally mean “nature”—and virtually nothing more. There’s no human figuration, nor other animals in these works of art. There’s no abstraction—and certainly no cityscapes. There’s virtually nothing in this display other than nature in its many guises. As Powell accurately noted in her interview, there’s a pastoral charm in “The Nature of Art” that’s—and there’s no other way of putting it—naturally soothing. As such, the hardest task for these artists was to find just that soothing touch that presents itself solely through such bucolic settings. It’s a sort of 21st-century throwback to the sublime of Romanticism, where moral worth was sought through the spiritual in art. Because if it’s one thing all these works share, it’s a touch of the spiritual. This is nature at its most subtle, where the smallest gesture surprisingly carries the most weight. 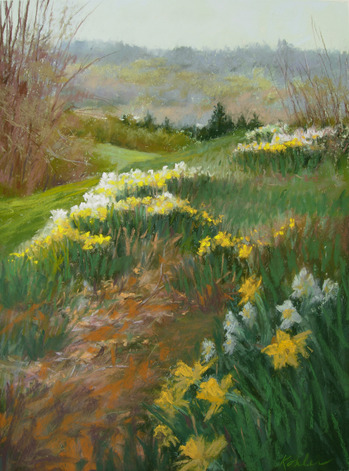 Take, for example, Janet Kohler’s striking “Daffodil Walk.” This marvelous pastel painting vividly captures these spirited flowers in bloom while also carving a thoughtful landscape through the strategic placement of varied earth tones. Modulating her palette with restful shades of blue in the background, Kohler crafts a contemplative setting of our local landscape while also adding a touch of drama. Marty Walker adopts a similar strategy with her acrylic “Hayrolls.” But in this instance, Walker uses a vertical recession to dramatize a series of hay rolls while also using her acrylics with a surprising multi-colored verve to insert a degree of spectacle. The result is a cleverly subdued painting whose feisty circular animation supports an otherwise tranquil setting. There’s always going to be an exception to every group. 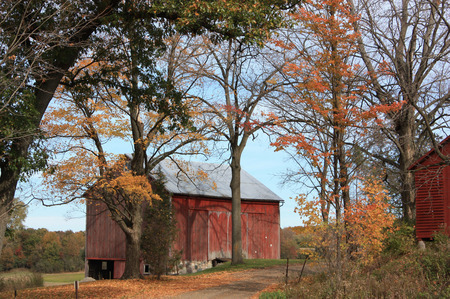 And in this instance, Jan Herrick's digital color photograph “Waterloo Autumn” captures a local barn at the peak of the fall season. The setting is tranquil enough—with a pensive yet expressive composition—whose use of digital technology captures a human-built visage with remarkable detail. Yet using nature as her palette, Herrick employs the turning of the calendar to produce a zestful photo that remains true to the call’s concept while also bending it to her own purpose. My favorite work in the exhibit is Rose Bradley’s watercolor “Iris Love.” And it’s a painting whose title is profoundly accurate. Because it can be seen as a genre work whose articulation is faithful to the flower; but it’s also far more than this. “Iris Love” is more accurately a channeling of emotion through the watercolor to create a refined portrait whose touch radiates empathy. The painting therefore certainly falls well within the range of the CCA’s call for artists, yet it also reflects a sort of spiritual transcendence the best illuminates the “Nature of Art.” In a display keenly devoted to care, Bradley gives us a selfless facade in the semblance of Mother Nature. “The Nature of Art” will continue through February 29 at the Chelsea Center for the Arts, 400 Congdon St., Chelsea. Gallery hours are 9 a.m. to noon, Tuesday-Friday; and 1 to 4 p.m., Sunday. For information, call 734-433-2787.